Guitarist Description: Crystal clear tone with brightly shining highs. Responds to overdrive distortion with a bright fuzz lead voice. All models Depth 3.0629 in. All models Diameter 8 in. All models Fastener Hole Diameter 0.1968 in. All models Inner Diameter 7.0275 in. All models Magnet Assembly Depth 0.8976 in. All models Magnet Assembly Diameter 3.3858 in. All models Magnet Weight 10 oz. All models Mounting Hole PCD 7.7559 in. All models Outer Diameter 8.1496 in. All models Packaging Dimensions 9.1 in. x 9.1 in. x 5.55 in. All models Voice Coil Diameter 1 in. All models Weight 2.6 lbs. 1 answers Can i use this to repair an ampeg BA108? 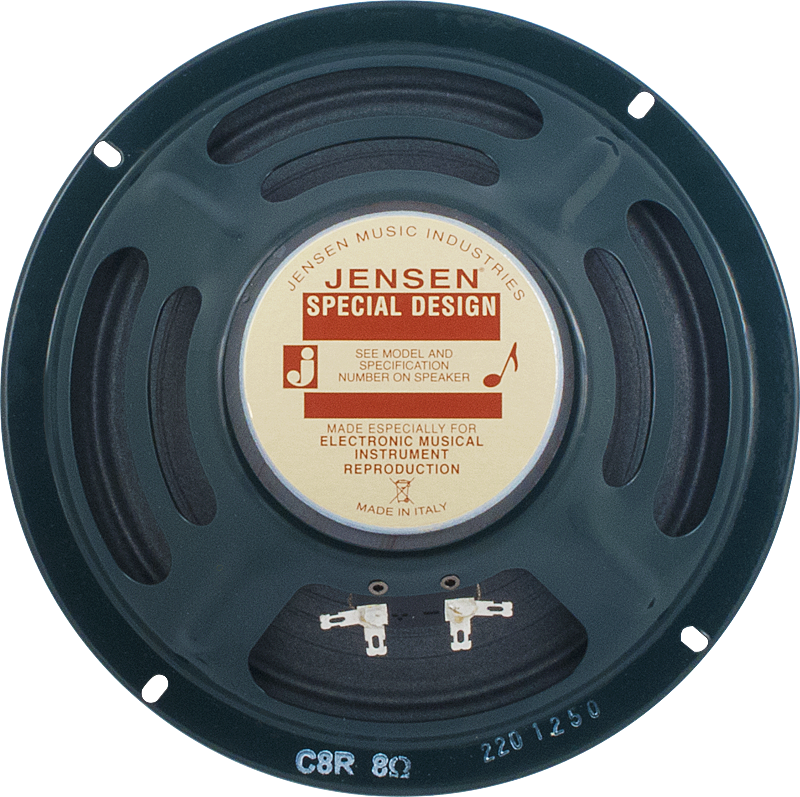 The Jensen C8R is not a bass speaker and the results, if used for bass, would not be suitable. 1 answers 25 watt rms o peak power? 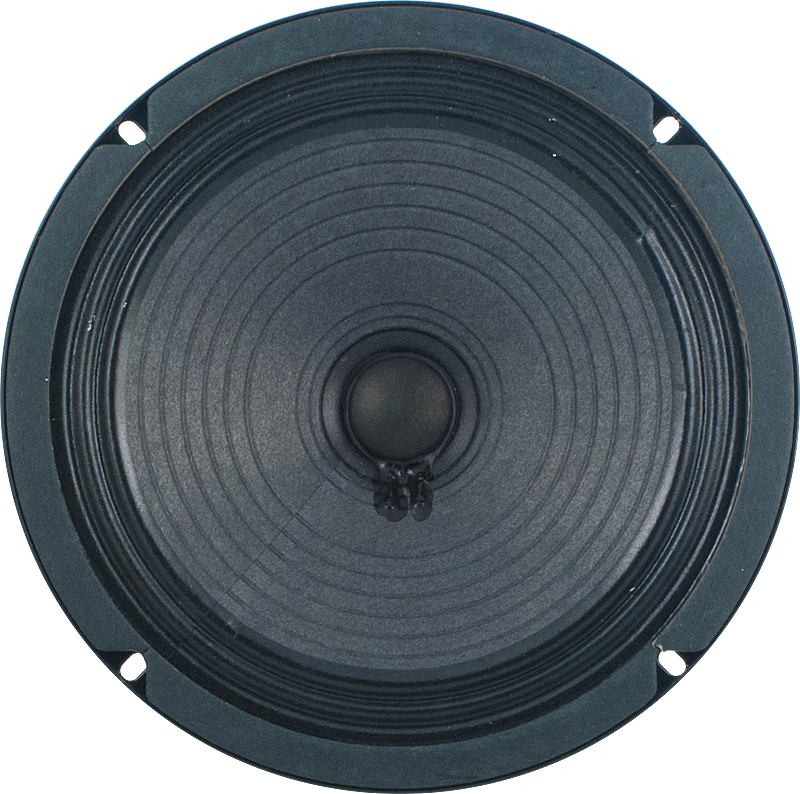 1 answers I have a Roland Street Cube EX and am looking for a 25 watt - 8" - 4 ohm speaker (to replace stock speakers - same specs) that has a good bass response to play electric bass through. I can get an O.K. tone now but am looking to improve the bass response. What would you suggest? Would a 20 watt Eminence Patriot 8" Lead/Rhythm Guitar Speaker Blue/Red Star, Stripes work (reviews say it has good bass response)even though wattage is wrong or is that a bad idea? Thanks in advance for your help. 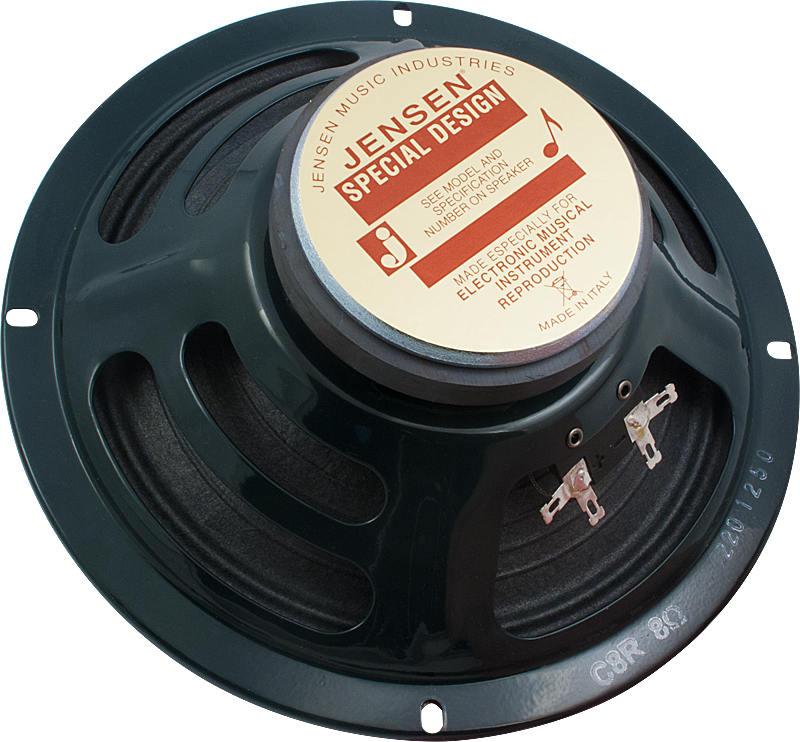 We do not recommend this Jensen speaker for bass. If you want to run bass and guitar out of one amp a PA speaker is a good choice. Please email us directly at: info@amplifiedparts.com for more information. 1 answers Where is this speaker made? What is the country of origin? Thank you. These speakers are made in Italy. 1 answers Would this work with a vintage record player? It is possible it would work, but with these speakers being voiced for guitar amplifiers, it may not produce the ideal sound. Big improvement in tone for my 1980 SFVC. The speaker is better than the original and just popped right - no mods required. Highly recommend. popped this into my 65 champ. PERFECT. exactly what i've been looking for tonewise. it just keeps getting better and better.